The great success of the railway between Dublin and Kingstown, constructed in the years 1832-4, resulted in a lot of schemes for other railways all over Ireland. The first priority was considered to be the extension of the Kingstown line southward towards Bray. This would no doubt have been carried out, but for a new system of propulsion championed by the eminent engineer Brunel, known as the Atmospheric system, in which the engine supplying the power was stationary, and the train was drawn along by the suction of a plug or piston through a tube. This system was emphatically denounced and opposed by Stephenson, the great locomotive engineer, and for a time, public opinion was much divided and puzzled by the claims of the rival systems as advocated by their two great protagonists. James Pim, an eminent Dublin citizen of his day, wrote a pamphlet or petition in favour of the Atmospheric system which attracted such widespread attention and support, that commissioners were appointed to inquire into and report upon it. Their report having been favourable, a loan of �, 000 was granted for the construction of a line to Dalkey, and land for the purpose was granted by the Harbour Commissioners, adjoining their line, locally known as "The Metals," for the haulage of granite from the Dalkey quarries for the Kingstown harbour piers. The line was worked by the 'Dublin and Kingstown Railway Company'. It was opened for traffic in July, 1844, after it had been running experimentally for some months previously. The 'atmospheric trains' ran for ten years. The distance was a little less than two miles, and ended between Castlepark Road and Barnhill Road (old Glenageary Road). At the Dalkey end the engine-house and pond were situated. The atmospheric line had a 4ft 8絠n gauge track, and lay about nine feet below ground level in a narrow cutting. There were ten bridges, and a tunnel giving 3 inches clearance above the train which made it hazardous for passengers to stick their heads out. Atmospheric traction was used on the upward journey to Dalkey, and the trains returned to Kingstown by gravity; the last third of a mile was covered by the trains under their own momentum, having left the tube at about 30mph. If a train stopped short of the station, the third-class passengers were requested to help push the train, while the others walked. In 1844, when the line was opened, trains left Kingstown every half-hour between 8am and 6pm. In 1845, when the Dublin and Kingstown line was providing trains between 6am and 11.30pm, the Dalkey service was extended to 9.30pm. In the first years of operation, it was recorded that the average speed of trains was about 26 and a third mph. The maximum speed obtained during tests was 51 and a half mph which considering the curves, was quite fast. Trains would return 'very lady-like' to Kingstown by gravity at an average of 18mph. Work began on a railway from Dublin through Dundrum to Bray (better known as the Harcourt Street Line ) with a branch from Bray to Dalkey. These lines were brought into use on 10th July 1854. Before that, on the evening of Wednesday 12th April, the last atmospheric train had run, the section being handed over to the Dublin and Wicklow who for a time substituted an omnibus service. The Dalkey line was then converted to the standard Irish 5ft. 3in. gauge, the curves being eased, the track lowered to save raising bridges, and the narrow Dalkey coaches being fitted with wide footboards. On 11th October 1855 the Bray-Kingstown section was reopened, steamworked, but on 20th March 1856 was again closed for further improvements. 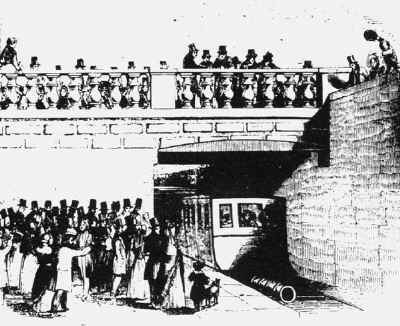 On 2nd July 1856 the line reopened. Soon afterwards the Dublin & Kingstown itself was also converted to the 5ft. 3in. gauge.